Birthplace : New Rochelle, New York, U.S.
Edson Buddle (born May 21, 1981 in New Rochelle, New York) is an American soccer player who currently plays for Los Angeles Galaxy in Major League Soccer. He was named after the famous Brazilian player Pelé (born: Edson Arantes do Nascimento). Something of a latecomer to this USA World Cup party, Buddle has staked a claim to make the most of his inclusion in Bob Bradley's 23-man party with his goals in the warm-up win against Australia pushing his claims for a start in South Africa. The ankle problem suffered by Jozy Altidore in the run-up to this World Cup and the absence of Brian Ching and Charlie Davies means the stand-by strikers have been presented with a glorious chance to push for a start, with Buddle keen to make up for lost time after many a long year in the international wilderness. This former Columbus Crew, New York Red Bulls and Toronto FC striker made his international debut way back in 2003, but he had to wait a long time to add to his USA caps collection. He seems to have timed his return to the international stage perfectly. Although he may have been a promising player for the United States national team, Buddle's injuries have made it difficult for him to break into the squad. He has figured for the U-20 and U-23 teams, playing in the 2001 World Youth Championship. Buddle earned his first senior team cap on March 29, 2003, in a friendly against Venezuela, but would not see the field for the U.S. again for seven years. On May 11, 2010, he was named to the preliminary squad of the United States national team for the 2010 World Cup, and on May 25, started in a 4-2 friendly loss to the Czech Republic. On May 26, 2010, Buddle was named to the US National Team bound for the 2010 World Cup. After his selection to the squad, Buddle contributed two first-half goals in a friendly match versus Australia on June 5, 2010 and also on June 18 in the Slovenia 2 - 2 United States match . 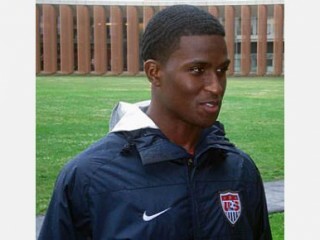 View the full website biography of Edson Buddle.